Beetles belong to an order of insects known as Coleoptera (sheathed wing) and they account for around 25% of all known life forms. Many beetles can be beneficial to society and do not require beetle control treatments. Most live outside and may be just occasional intruders. Nevertheless certain types of beetle may enter and start to attack food produce or textiles and cause an immense amount of damage unless the use of beetle control is used. The flour beetles consume wheat and other grains, are adapted to survive in very dry environments, and can withstand even higher amounts of radiation than cockroaches. 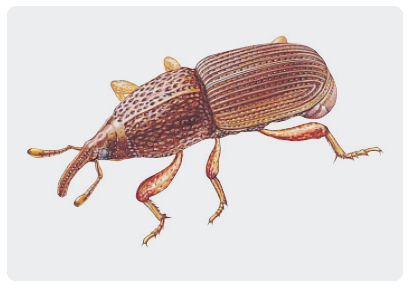 Beetles and moths found in food are usually known as SPI (Stored product insects) and the food beetles include Confused Flour Beetle, Merchant Grain Beetle, Larder Beetle, Rice Weevil, Grain Weevil, Biscuit Beetle and Spider Beetles. 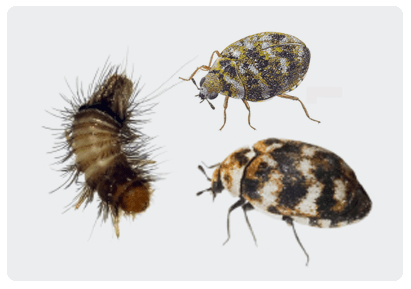 Beetles can also be textile pests and damage items such as woolen carpets or woolen clothes as well as materials containing feathers, hair or leather. These, along with clothes moth, are called textile pests and examples include carpet beetles and fur beetles. Beetle control treatments will depend upon the type of beetle and therefore careful identification is required first. 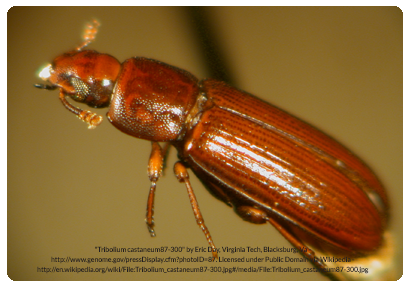 For example the woodworm beetle, at first glance, looks almost identical to the biscuit beetle but both attack completely different materials and thus require a different approach in beetle control treatments. It is advisable for those who store or produce food or clothing and other textiles to employ a pest control company to regularly monitor for SPI or textile pests in order to identify the insect before it starts to damage stock. Once the pest becomes established it is usually necessary to throw out infested materials. Beaver Pest Control can provide a free quote for this monitoring service and a Field Biologist is available for more in depth surveys and reports. Beetles can enter your establishment via food, textiles, bird nests or simply through doors and windows. 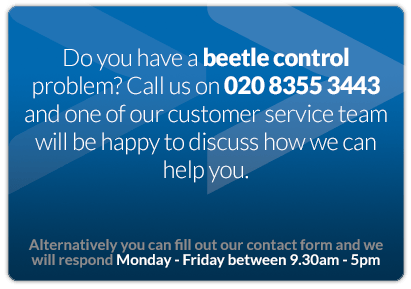 If you are experiencing a problem with beetles try to keep one and use it to describe to our staff as to what it looks like and where you found it. More often than not we will be able to identify the beetle over the phone.